We never know what we’ll get before watching a film for the first time. We know the plot, the cast and maybe even the director but what shows up on screen is always fresh for us to interpret. In some instances we may get more than we desired; not all movies are meant to uplift us. It is simply a medium used to tell a story and what that story is can be told from anyone’s perspective. We don’t always leave the cinema with a grin on our face but rather with emotions that were not there when we entered. 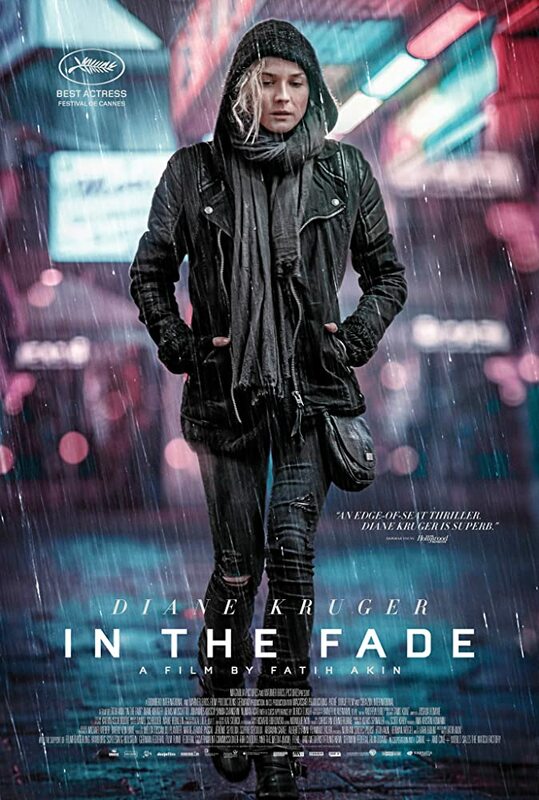 Fatih Akin’s film In the Fade is a blunt, powerful, completely immersive piece of cinema. The story centers on a wife/mother Katja, played by Diane Kruger (National Treasure, Inglourious Basterds), who is forced to deal with the sudden death of her husband and young son due to a store bombing. The film is divided in three chapters: Family, Justice and Sea. In their own right each chapter can be a film all its own. We are alongside Katja the entire journey as each chapter offers a different emotional state for Katja and at the same time changes her persona all together. There is a slight chance that films focusing on one character for the entire film can be tedious or drawn out. This is certainly not the case as Diane Kruger pulls us in immediately. For the entire runtime as a viewer I felt everything Katja went through. I’m not a family man or in a relationship so these things have no attachment to me directly but through Kruger’s performance you cannot avoid these feelings. It is not a surprise as to why Diane won Best Actress at the 2017 Cannes Film Festival for her performance. Her presence on screen is primal and visceral; at times you feel as if what is transpiring could be a documentary. Add to the fact that the film starts with a home recording of Katja marrying her husband as he is released from jail and her journey feels as real as anyone else’s sitting in the theater. Through each chapter we see a different side of Katja and that of course is due to actions that transpire throughout the film. I never questioned the motives or directions Katja took as they all seemed logical in the sense as that would be the course someone might take after losing loved ones in such a horrific and violent way. Diane not only carries the film but raises it high above her head because it is hard to imagine anyone else delivering in that capacity. The film I felt was handled quite stunningly by its director Fatih Akin. As powerful as Diane’s performance was I feel in certain aspects it was heightened by Akin. The emotions we have are enhanced by the visuals on screen and the way Akin shot each chapter then presented them made each feel like its own separate entity. The second chapter titled Justice I felt was extremely powerful as the courtroom felt more like an examining room completely in white as witnesses sat center as they were questioned. It is also at the conclusion of this chapter I felt completely in tune with this film as the camera movements, sound and performances were all in sync to give you this immersive experience. At the end of the film as well I believe Akin offers the viewer a deeper meaning to the films actions in that hate or darkness within us can consume us if given the chance but it is our will power to overcome and triumph against these feelings that will make us stronger. As I said this film is not meant to uplift or put a smile on anyone’s face; that is not its intention. Sadly this film has more precedence in today’s world than any other time as events such as store bombings have become more common. In that sense then maybe this is the start of new stories to be told of experiences not yet widely known or thought of. To give awareness of all the pain and how it creeps in to ever crack to destroy people’s lives. In that is where cinema is a great tool because as much as we can look at pictures and listen to stories it is a completely different experience to feel what is happening.